We are back at it with our second edition of ‘In the Spotlight!’ This month I have a recent client who’s diligence and attention to detail has been the best I’ve seen. And, it’s really no surprise she saw great results. After the first session/evaluation, each one of my clients receive specific instructions on exercises and drills to perform daily. This is an area many of them could be more consistent to see better results. That was not the case with Brooke. Brooke was always eager to learn and apply the strategies I recommended on a daily basis. This allowed her to see great improvements with her lower back/hip pain and begin slowly returning back to the activities which she loved so dearly. Q: First, tell us a little bit about yourself and where you are from? Q: Other the years, what forms of exercise have you been into? Q: What are the top reasons you enjoy CrossFit and staying active? Q: What was the catalyst that made you reach out to Garrett in the first place? Q: What are the some of the improvements you’ve seen so far? Q: An individualized corrective exercise program that includes mobility, activation, strength, and movement was a big part of your success… Why do you think this was the case? Q: Do you think you would’ve seen positive results without the corrective program or if you only completed your exercises sparingly? Q: Do you have any advice for others who are going through the same situation as you? Q: Looking ahead, do you have any new goals you are working towards? Thank you for reading the ‘In the Spotlight’ segment. And, a big shout out to Brooke Kocher!! Please feel free to comment below with any questions or feedback. Often, many people exercise without any emphasis on improving their weaknesses. Our top priority becomes reaching our goals, whether that be weight loss, improving athletic performance, or just general fitness, and we create programs based solely on those aspects. I am a firm believer that we need to, as Gray Cook says, “Move well, then move often.” Moving well means knowing your bodies restrictions. Where do you lack adequate mobility, and stability? And, how do you measure and improve these qualities without paying for professional guidance? In this series I am going to help you self-assess joints like the ankles, hips, and thoracic spine, and provide corrective strategies to incorporate into your program based on your limitations. The ankle is comprised of 3 bones, the talus, the tibia, and the fibula. This hinge joint that allows both plantarflexion and dorsiflexion is controlled by muscles that are found around the shin and calf. Besides injury or trauma to the ankle joint, footwear commonly causes the loss of normal mobility. This is especially prevalent in women who wear high heel shoes. With the ankle remaining in a plantarflexed position for long periods of time, we lose our natural dorsiflexion range of motion. Loss of ankle dorsiflexion can become problematic in functional movements such as squatting, single-leg stance, and lunging. Also, when we lack adequate mobility at a joint, it decreases the proprioceptive information to and from the nervous system. Do you have trouble balancing on a single-leg? It may not actually be a stability (“balance”) issue, but the lack of motion causing subsequent decrease in sensory feedback and reflexive control. Normal ankle range of motion is 50 degrees of plantar flexion and 20 degrees of dorsiflexion. Most commonly, limitations in dorsiflexion cause the biggest restriction to functional movement, so we will start there. To evaluate ankle dorsiflexion, I recommend taking off your shoe and following along with video. Please take note at what distance from the wall the heel started to raise up, this will be a good measurement to track progress. 5 inches is a good indicator of adequate ankle mobility. Did your front knee reach the wall from 5 inches away before your heel lifted up? If it did, read no further. But, for those of you who came close or maybe failed miserably, here are some corrective strategies to improve the important ankle mobility that you lack. 1. Restoring normal tissue quality with foam rolling. 2. Elongating the gastrocnemius and soleus muscles of the calf. 3. Improving mobility of the entire ankle complex. 4. Additional band assistance to mobilize the ankle. Now that you tried a few corrective strategies to improve ankle dorsiflexion, re-test and see if you had any success. It is possible that once you find which mobility drills work for you, you will see quick improvements in dorsiflexion. Remember, we aren’t trying to improve ankle mobility just for the sake of it. This is a very important aspect of proper functional movement and the lack of motion can increase the likelihood of injury and decrease performance. Garrett McLaughlin is an athletic trainer and personal trainer at PhysioFIT in Nashville, TN. He prides himself on not only reaching his client’s goals, but making them move better in the process. 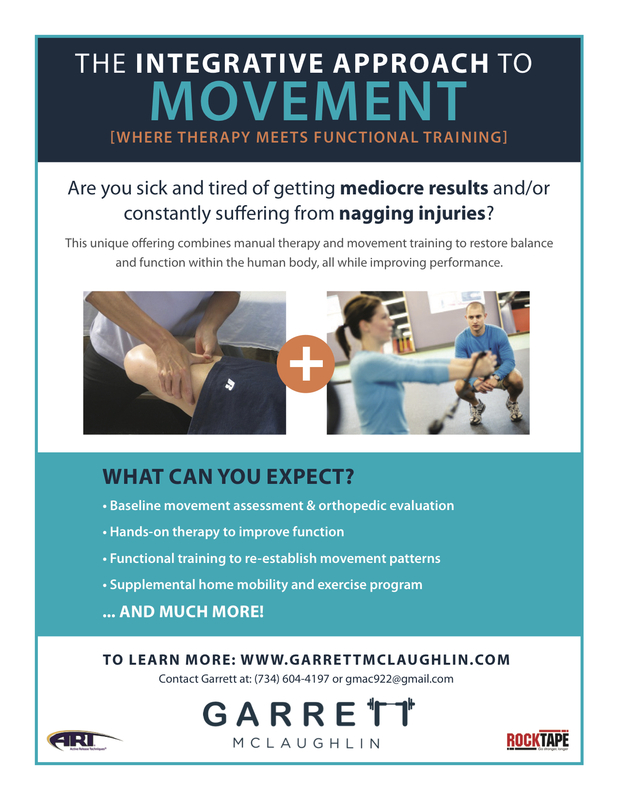 Garrett is a certified active release techniques provider, treating soft-tissue injuries quickly and effectively. For more information please contact Garrett.